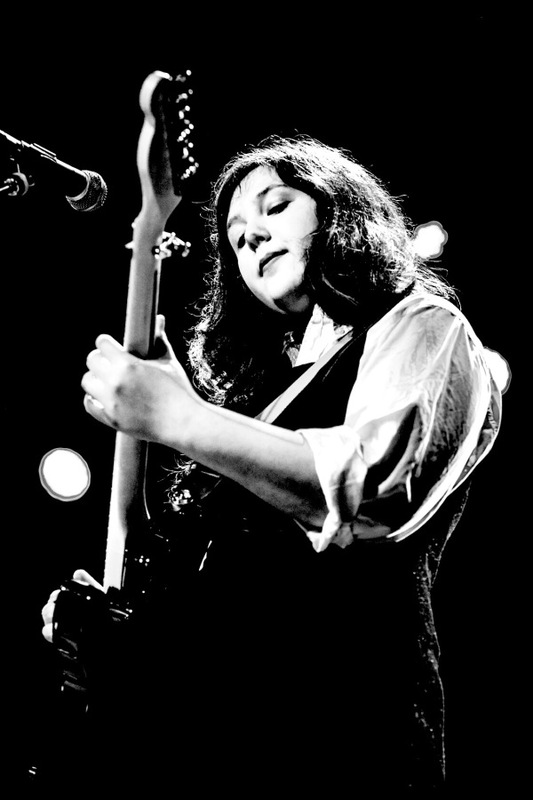 “I should start by saying that I’ve opened for a lot of bands on this stage before, so to be the main act here tonight is just – it’s really wild,” were the first words out of Lucy Dacus’s mouth last night at Union Transfer. Taking shelter from the pouring rain, a near sold-out crowd of hipsters just old enough to understand some of the darkness embedded in Dacus’ lyrics gathered to witness her energy firsthand in what was the penultimate stop of her recent tour. Though her latest record Historian came out a little over a year ago now, Dacus earned even more reverence from the indie rock world for her collaboration with Phoebe Bridgers and Matador labelmate Julien Baker to form the supergroup trio boygenius last fall. Their self-titled EP was a testament to the way that the work of these female musicians could simultaneously fuse together and stand alone (a dynamic quality critics typically reserve for the male “geniuses” of the world). Though some of the songs on that EP are quiet and emotional, there is an undercurrent of unsettled distortion that has its source in Dacus, and she brought that emotional dissonance to Philadelphia last night. After playing nearly half of Historian, Dacus returned to her 2016 debut No Burden with “Direct Address” (my current favorite of her songs), smiling as the crowd cheered after the closing couplet “I don’t believe in love at first sight / Maybe I would if you looked at me right.” Laughing, she said “Oh, that’s cute. I try not to look at anybody at the end of that song, because it’s a lot of pressure, so I’m sorry if tonight I accidentally looked at you.” She continued with another love song, “Green Eyes, Red Face,” before taking off into the dreamy pulse of Edith Piaf’s “La Vie en Rose,” a cover that Dacus released last month for Valentine’s Day as the first of what she announced as a series of holiday songs. Dacus finished up the set with some of her more rocking songs, seamlessly transitioning from No Burden’s opener “I Don’t Wanna Be Funny Anymore” into the lead-off track from Historian, “Night Shift,” during which the whole room could be heard singing along over the growing guitars. Though the lyrics wax poetic about a breakup with beautiful stanzas made up of language that is simultaneously soft and violent, the feelings of loss, or perhaps better put, the feeling that you “can’t lose what you never had” encompasses more than just the romantic side of heartbreak. The undulations between whispers and screams in “Night Shift” mirror the unique tension that comes with losing the presence and regularity of a lover, a friend, a family member, a person, a constant in one’s life. “Night Shift” is just one example of the universality in Dacus’ songwriting. She is an undeniably gifted storyteller, and the unending captivation that I and others have with her work is rooted in her ability to illuminate the connections and oscillations between the outer world and the inner self. Her music retains an open-mindedness that feels harder and harder to find anymore, containing a power to speak to so many different experiences and emotions without sounding vague. Different lines stand out at different times, depending on the way the listener’s soul is negotiating the world. These songs feel timeless, as if the lessons within the music about love and family and human connection are ones that we will never outlive, that we will never stop learning. This entry was posted on Friday, March 22nd, 2019	at 5:22 pm	and is filed under News	. Responses are currently closed, but you can trackback from your own site.